Clues from the wreckage from US Airways Flight 1549, which crashed in the Hudson River, are going to the best investigators in the world: the black boxes to the National Transportation Safety Board, the engines to the manufacturer’s experts and a bird feather to a Smithsonian museum. The National Museum of Natural History in Washington may not leap to mind when both engines on a high-tech plane quit at 3,200 feet. 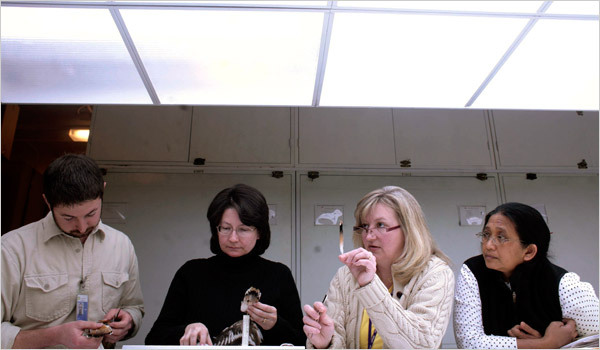 But around the corner from the stuffed African elephant that greets the visiting hordes of schoolchildren, down a back hall from the employee bike rack, a staff of four in the Feather Identification Lab took in samples from 4,600 bird-plane collisions, or bird strikes, last year. Arriving mostly in sealed plastic bags, these included birds’ feet, whole feathers or tiny bits of down, and pulverized bird guts, known as snarge. After the miracle landing in the Hudson River, we said “Find that Bird.” Tonight, the NTSB says they have it! This is another testiment to the greatness of America, where investigators work for long periods doing detailed crash analysis so we save lives in the future. The pilot of Flight 1549, Chesley “Sully” Sullenberger and his flight crew were the first heroes of this event. Now the investigators of the National Transportation Safety Board (NTSB) are my heroes, along with other experts they use. The NTSB says this investigation could take a year. Samples of the bird material have gone to the Agriculture Department for a complete DNA analysis…. Investigators said Wednesday they have found the remains of what may be a bird in the engine of the US Airways jet that made a dramatic landing in New York’s Hudson River. The National Transportation Safety Board said an examination of the Airbus 320‘s right engine revealed evidence of “soft body damage” and that “organic material” was found in the engine and on the wings and fuselage. Samples of the material have gone to the Agriculture Department for a complete DNA analysis, the board said. A single feather was found attached to a flap track on the wing and will be examined by experts at the Smithsonian Institution. The pilot of Flight 1549, Chesley “Sully” Sullenberger, reported a “double bird strike” and a loss of power in both engines before gliding the plane to an emergency river landing last week. All 155 people on board the flight to Charlotte, N.C., survived. The board also reported Wednesday that…. You are currently browsing the archives for the crash category.